Cut off top of peppers and clean out centers. Fill each bell pepper half way with water, then microwave for 6-7 minutes. Meanwhile, brown 1 pound of ground beef with ½ cup of onion. Add the taco seasoning to the meat according to the package on the taco seasoning packet. Next, add the ½ can of diced tomatoes and bring to a simmer for 10 minutes. Drain the water from the bell peppers; place the bell peppers in a loaf pan. 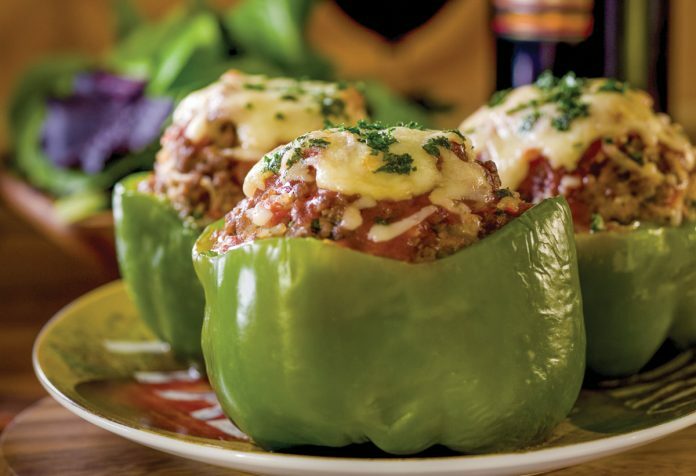 Fill each bell pepper ¾ with the meat mixture; fill the rest of the bell pepper with cheese. Pack the cheese on top of the meat mixture.